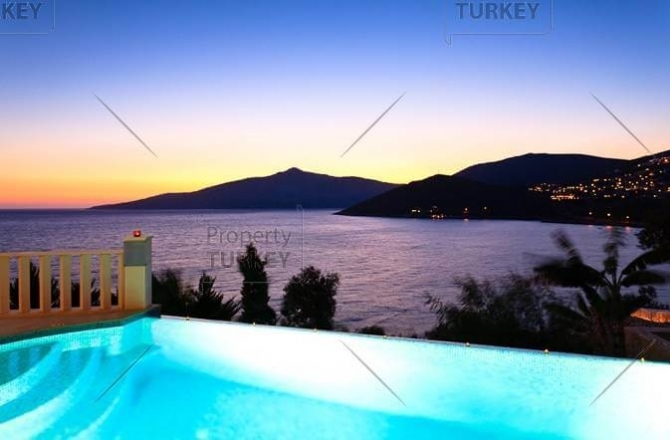 Panoramic, uninterrupted sea views over the Mediterranean Sea and unfettered luxury combine to ensure this villa's top spot on Kalkan's list of premier properties. This beachfront villa in Kalkan's upmarket Komurluk has four bedrooms, five bathrooms and is built to exceptional quality, with exquisite fittings and design. What's more, you can see a 180 degree sea view panorama from almost every window. A truly magnificent advantage. 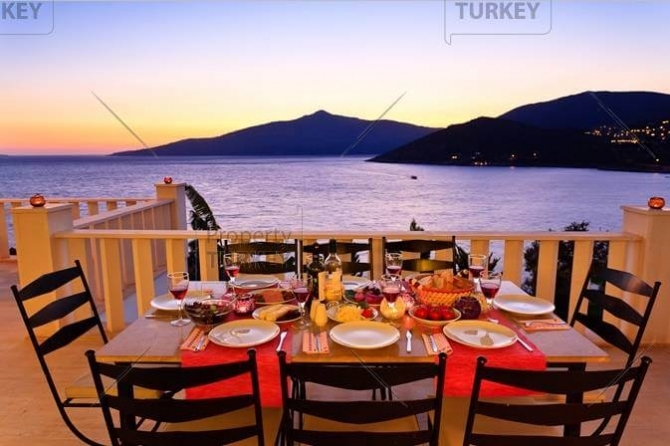 This Kalkan villa has large open plan kitchen with spacious living room which has access towards the terrace and a private swimming pool area, which is surrounded by a very spacious pool deck. There is plenty of space for the whole family (or for a couple of families!) whether inside in the living area or lounging about on the deck. Other features include air conditioning in every room, a spacious basement that can be converted into a games room or even another bedroom; an office (for those who just can't leave work); a beautifully modern kitchen with every mod con imaginable; double glazing; solar heating; a jacuzzi and an open fireplace in the living area. This villa is just phenomenal. When you set foot in this property you'll fall in love with its elegance, privacy and exquisite design. Should you feel the need to leave your luxury pad, it's just a short walk to Kalkan's cobbled old town streets, ancient harbour, rooftop restaurants and sophisticated bars and shops.